Today, water colour painting has become a very popular medium in art. It is highly expressive, exciting and enjoyable and a versatile medium. The art of painting in water colour is to produce a transparent and a spontaneous picture. A good water colour is capable of capturing all the glories of nature, light and sun, air and mist, with just a few strokes of the brush. The main delight of a water colour painting is its fluidity and transparency. Observation is the starting point and may be supplement by knowledge generally by reading books. Treat a book rather like a map for a journey: it is helpful and is based on sound observation and offers fairly simple technical advice. However, 'Dharshana Chithra' book helps every child and adult interested in painting irrespective of age to learn painting sceneries methodically and to overcome difficulties. Nayanajith Premaratne, artist, author, teacher and graphic designer highlights guidelines that provide simple logical solutions that work. The book illustrates each problem with a typical beginner's painting and then demonstrates the pitfalls and solutions that should be applied as remedy. In addition you'll discover how to improve the vibrancy of your colours by mixing them and applying in transparent glazes. There are close up details that reveal the artist's technique and a wealth of information offering many alternative colour solutions when doing typical scenery. The theories and solutions shown in the book are applicable to painting in any medium, whether it is oil, water colour, acrylic or pastel. The book covers a broad spectrum from simple colour mixing in overcoming difficulties with composition, size and shapes. To make it simple and easy for a beginner the author has shown step-by-step demonstrations entirely in colour to paint a wide range of subjects, houses, trees, different textures and light effects. Special emphasis must be made of the 10 formulas that solve design problems and offers a wide colour coding variety to the artist. These 10 formulas could be described as absolute life savers in the choppy waters of scenery painting. This book deals with the practical problems involved and the solutions how to control it totally. Nayanajith has also shown is a unique work of art 'Seewali Maha Thera' by his grandfather, the famous early 20th Century Buddhist revivalist painter Kalaguru M Sarlis, and water colour paintings and picture story illustrations done by his father Kala Booshana Susil Premaratne. Hopefully, finding these paintings inspiring one could use them as starting points for own creative solutions. 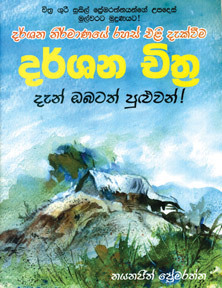 The publication also serves as a worthy tribute to three giants of Sri Lankan art, Kalaguru M Sarlis who belongs to the old masters, Kala Soori G S Fernando, eminent water colourist and Kala Booshana Susil Premaratne the artist and musician and the author's father. These masters dedicated their lives to foster art in Sri Lanka and have been the teachers for me and Nayanajith. Therefore, it was an honour and a privilege to have been able to contribute a foreword and thank Nayanajith for allowing me to become a small part of the publication. Today the only two pupils who remain from this generation is Nayanajith and myself who are still active at the easel. This book will serve as a lasting memorial of an artist's effort to the present and future generations which blazed and truly created waves in the sluggish backwaters of art. The book is available at Vijitha Yapa Bookshops, Sarasavi Bookshops, M D Gunasena Bookshops and Thusitha Bookshop, Ratmalana.